It is the kind of game you sit down to play for 5 minutes but end up playing for hours. A word of warning, if you get addicted to video games easily approach this one with caution because you might end up wasting away glued in front of your computer screen! If any of you have played the game Mincraft, it is much like that but in 2D. The lack of a third dimension is made up for by just how polished the game is and the endless possibilities that it presents. At first the aim of the game may not be clear and the graphics look like they are from the early 90’s but don’t let this fool you, the gameplay is awesome. Basically you need to collect resources (wood, stone, gems, ore) and build structures for NPC characters which will appear as the game progresses. You also need these resources to make more powerful weapons and tools and stronger armour to eventually face off against some pretty nasty and powerful bosses. The ‘sandbox’ style gameplay is fantastic and gives a ton of freedom to run off and do whatever you want. I am quite often not a fan of single-player games, but whether I am playing by myself or with others the game is just as much fun and playing alone doesn’t seem like such a waste considering that any items and things you find are useable in multiplayer games as well. I have tried not to give too much away in my little review because half the fun of it is discovering just what lies a little bit further below the surface, I would definately give this game a rating in the 95% – 98% overall rating range. So if you are in the market for a game that is a little different then make sure you give this title a look. I bought it off Steam (www.steampowered.com) when it was on special for about $3.50 but at the time of writing this article it is currently retailing for $9.99. 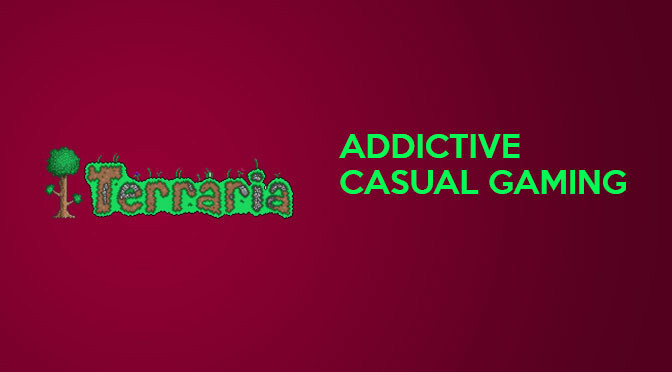 Make sure you check out the official Terraria trailer on YouTube as well. I sure as hell have got much more than my monies worth out of it!